LightBright makes it easy to share your daily life through it’s tumblr-style post types. Using the custom post types/taxonomies added in WordPress 3.0, the theme adds special integration options for photos, video, audio, quotes, notes and links. If you love the format of tumblr but don’t want to give up the versatility of WordPress, this is the theme for you. LightBright comes with four different color variations. If Turquoise isn’t your style, then try switching to the Purple, Green or Black color schemes. Custom tumblr-style post types make it easy to share photos, videos, notes, quotes links and audio files at the click of a button. This theme utilizes timthumb to automatically resize your thumbnail images. Because of this, only one thumbnail images is required per post, despite the various thumbnail sizes used in the theme. 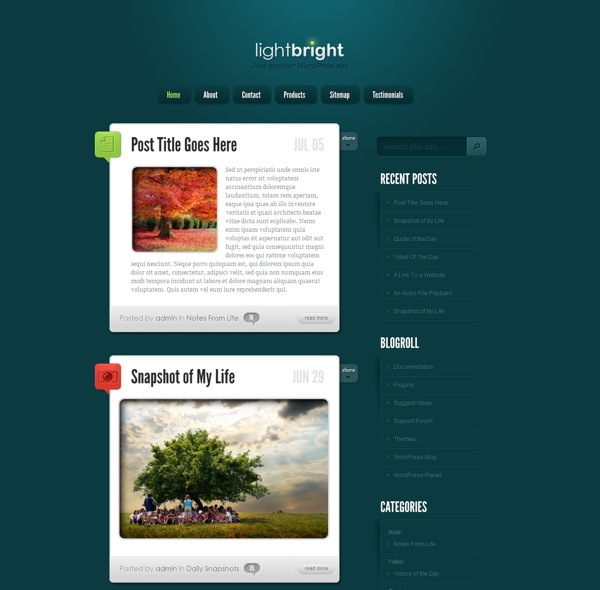 With LightBright you can place 125×125 banner images in your sidebar and 468×60 ads to your post pages with ease. Advertisements are handled from within wp-admin, and can be turned on and off at any time.